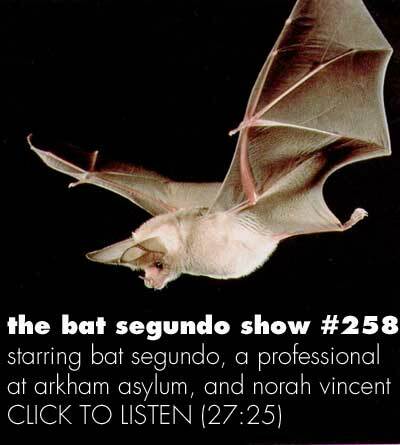 Norah Vincent appeared on The Bat Segundo Show #258. 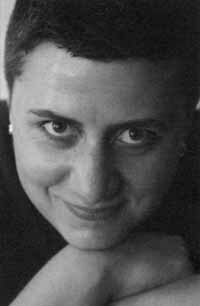 Norah Vincent is most recently the author of Voluntary Madness. Condition of Mr. Segundo: Challenging pseudonymous authorities about his voluntary commitment. Subjects Discussed: The Lanterman-Petris-Short Act, homelessness and mental health care, the revolving door of mental institutions, Marvin Olasky and community responsibility, the bureaucratic process of mental health care, why Vincent didn’t break down the costs of staying in pseudonymous institutions, the unwillingness of Vincent’s health care provider to have Vincent pay for her stay in these institutions, experiential journalism vs. objective journalism, the trouble with corroborating stories within Vincent’s books, setting limits and journalistic ethics, quibbling with the term “diagnosis,” the distinction between psychotics and psychopathics, care for dangerous people, antipsychotic drugs, counseling vs. drugs, empirical solutions vs. medical expertise without arrogance, the moral question of whether or not doctors should inform psychopathics about the effects of drugs, the issue of consent in medicine and journalism, whether regular “reality checks” can help a psychotic improves her mental condition, and happiness vs. getting better. Correspondent: You quibble with the term “diagnosis.” You write, “There are no diagnoses in psychiatry. Only umbrella terms for observed patterns of complaint, groupings of symptoms given names, and oversimplified, and assigned what are probably erroneous causes because these erroneous causes can be medicated. And then both the drug and the supposed disease are made legitimate, and thus the profession as well as the patient legitimized, too, by those magical words going hand in hand to the insurance company ‘Diagnosis’ and ‘It’s not your fault.’” But if there are no diagnoses in psychiatry, well, where is the starting point? I mean, obviously, you have to start somewhere and identify a particular problem — even on a simplistic level — in order to help another person. So what of this? Vincent: Well, yeah, that’s the difficulty, I guess. Right now, we don’t have a test that can tell you, “You’ve got bipolar disorder” or you’ve got any number of all these so-called illnesses. Which I don’t doubt are real entities. Clearly, when you see enough of these patients, you see the patterns that they’re describing. And people who are schizophrenic tend to be paranoid. All these various things that — it’s not that the groupings are illegitimate in that way or the observations are wrong. It’s just that it does leave an enormous gray area. And it means that you can diagnose somebody as having this thing without any really concrete way of knowing that they do, in fact, have it. And I do think that can lead to a lot of problems. Such as, for example, people again have written a lot about the way that diagnoses of depression have, I don’t know, tripled in the last ten or fifteen years. And I think you have to ask yourself how many of those people have something that’s a pathological depression. Or is it a situational depression? Not being able to distinguish between those two things is, I think, problematic. Correspondent: We’re talking then largely about the specific difference between someone who is psychotic, who is merely someone who cannot properly distinguish between their reality and their imagination and their dreams, and is not necessarily violent, versus someone who is psychopathic. Who is going to be prone to violent behavior and the like. Certainly there has to be some degree in which we have to prevent people from harming themselves or harming other particular people. I agree with you that “psychotic” does, in fact, get a bad rap. But nevertheless, there is this larger term of people who are, in fact, going to be committing violent behavior. So I’m wondering. Why quibble with the notion, as you do in one of the interim moments in the book, about this impression between so-called psychotics in movies and everything? When, in fact, there are dangerous people out there. Vincent: Oh yeah. And there’s no question that, right now, medication and, in some cases, putting these people into an environment where they can’t hurt people is all that we have. It’s the best that we have right now. I would hope that someday we would have medications, for example, that can specifically address what’s going wrong in the brain of a schizophrenic person. And that’s just something we don’t have right now. We don’t know. We don’t understand the mechanisms of schizophrenia. Or what appears to be. There again is the question. Well, you may appear to be schizophrenic. But without a test that can tell us, we don’t actually know whether you are or not. Or whether you’re manifesting symptoms that may be entirely something else. An allergy. I mean, think about if you were to go to the hospital and say, “I’m having terrible chest pains.” And you were assuming you were having a heart attack. And there was no way to know whether it was that or indigestion. There are a lot of symptoms that can be caused by various different things. And I think that’s the part that’s missing for us right now.